As any reader will probably guess from the book, I LOVE tattoos. When they are meaningful I think that they can be a really beautiful form of art. That having been said, I don’t have any tattoos. Not a single one. Why? Not because I’m afraid of needles, but because I’m incredibly fickle. What I like one month, I know I’d regret another month. My husband doesn’t have any of these issues. Like O’Connell, he knows what he wants, makes up his mind and goes for it. He recently finished his full sleeve tattoo which goes from his wrist, up and over his shoulder. I watched him for months consider what he’d have, design it out, and then sit for hours in the chair while they painstakingly created this beautiful sleeve. A sleeve tattoo requires a huge commitment. It’s so prominent and visible, that you need to truly love the design to live with it forever. O’Connell’s sleeve is a celtic design. Being Irish is a really important part of who he is and I think he’s proud to show that part of himself, to literally wear his nationality on his sleeve. When Em first sees it, she doesn’t see the ink as adding an element of intimidation to his demeanour. She sees the beauty in the artwork. His other tattoo is so much more personal. In the early stages of their friendship, O’Connell reaches a low point. He is struggling not to get dragged down by his past dealings with an alcoholic mother, and his lack of tangible prospects to offer Em. At this point Em grabs a pen and writes a quote across O’Connell’s pectorals. She tells him that anyone can be a champion if they can get back up and keep fighting when they’ve hit rock bottom. It’s kind of a revelation to O’Connell that the only way is up. She has given him the hope and drive to lift himself up and try to make something of himself. It’s only fitting then that he captures the memory the only way he knows how, by having the words tattooed exactly where she wrote them. O’Connell suggests when something meaningful happens that he feels a tattoo coming on. It seems he likes the idea of using his body as a human scrapbook and preserving, by tattoo, the very best of his memories. It’s a pretty good bet then that they’ll be more tattoos to come by the end of the sequel! I was born in Cardiff, South Wales although I left to study law at the University of Bristol, England. Four weeks before graduation I fell in love, and stayed. Ten years later I convinced my crazy, wonderful fire fighter husband to move back to Cardiff with me where we live with our two equally crazy sons. Juggling work, writing and family doesn’t leave a lot of time, but curling up on the sofa with a cup of tea and a bar of chocolate for family movie night is definitely the best part of my week. 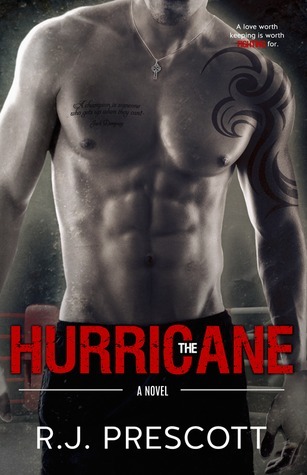 “The Hurricane” is my debut New Adult Novel. Thanks for hosting today, Sydney!